Almost everyone here has powers. Touma's a level zero esper (i.e. powerless), but that's because his power is actually an anti-power. His right hand is an Imagine Breaker that can nullify both psychic and magical attacks, although unfortunately it also keeps killing his good luck. I'm also going to have to define terminology. 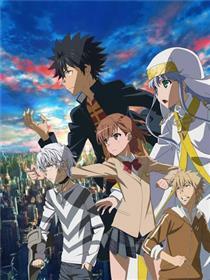 INDEX is the series and Index is the character. (Having to say "A Certain Magical Index" every time is cumbersome.) Similarly RAILGUN and ACCELERATOR are series, of which Misaka and Accelerator are the respective protagonists. I won't deny any of that. If you look at the release dates, though, you'll see that this series helped to kick off those trends, not the other way around. Back then, a lot of that was still new. It's also distinctive in other ways, with its relatively intricate worldbuilding and knack for attention-grabbing ideas. Index can't use magic because she's the Church of England's library, with 103,000 grimoires in her brain. She's useless! However she's also somewhat adorable, if you can cope with her being a brat who keeps biting you. How Touma ends up resolving her story arc is both shocking and moving. The Mikasas are a mind-bending idea, but wait until you see how they're connected to Accelerator. What's happening there is an abomination. It's only not a war crime because no one's at war. You'll also discover a girl with delicious blood, the strange thing about Kazakiri and the wacky ep.15. It's a surprisingly bloody show, despite the usually light tone. The body count is... uh, technically in five figures, now I come to think of it. There's also plenty of gore splashed about and Touma gets hospitalised so often that he'll be boasting about it when a story arc ends with him still on his feet. The morality isn't simplistic. Sometimes the antagonists are right, while one of the most loathsome villains you could imagine can be knocked down several pegs and turn into a possibly self-hating paradoxical hero who might be trying to make some kind of amends. (Maybe. No promises.) Oh, and Touma is equal-opportunities when it comes to punching people in the face. Men? Women? Who cares? If you're being bad and need stopping, he doesn't care about anything else. There's some gobsmacking material in this show, if you stick around for it... but it's not even trying to hit that level consistently. This show doesn't want to get heavy. It can also feel a bit formulaic sometimes. Touma has amusing scenes with girl(s). Villain. Fight coming. Yeah, we get it. Also not all story arcs are equally powerful, so for instance a problem with Kazakiri's angst in the final arc is that it's so easily and trivially addressed. We understand how she feels, but we also don't see it as a meaningful obstacle. That's a shame, because Kazakiri's lovable and nice, deserving a more memorable story. That said, though, it's an entertaining show that always makes it easy to watch one more episode. I galloped through this first season. It's not a first-rate show, but on reflection I've decided that it's more impressive than it looks.